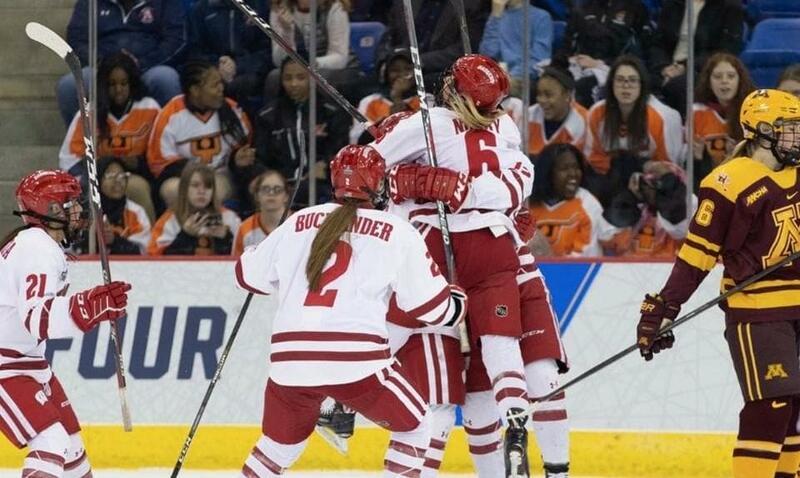 It was NCAA women’s ice hockey’s version of Clash of the Titans. No. 1 Wisconsin and No. 2 Minnesota had faced each other 11 times over the last two years heading into Sunday afternoon’s NCAA championship game. Wisconsin had won eight of those games. It won its ninth on Sunday at the People’s United Center. The Badgers played a complete game from start to finish, topping the Golden Gophers 2-0 and clinching Wisconsin’s fifth national championship. The Badgers had been a batch of tough-luck losers for the last few years. They made the Frozen Four the last six seasons, but came up a bit short in all of them. Ironically, four of those losses came to Minnesota. Old narratives weren’t the story on Sunday though. This year’s Badgers team went on a two-month tear beginning in February that saw them go 14 games without a loss, which culminated in a 2-0 win in the final game of the season. Wisconsin head coach Mark Johnson credited his team’s drive down the stretch to his players’ resolve. Two players who best embody “dialing in” in the biggest games of their lives are Wisconsin senior co-captains Sophia Shaver and Annie Pankowski. In what would end up as their final collegiate game, they scored the only goals of the contest. Pankowski, who scored 11 goals in seven postseason games, struggled to define precisely what made this team special. While Pankowski’s goal, the second of the game, was a maximum-effort shorthanded tally, the Badgers only needed one goal to win this game, thanks in large part to redshirt junior goaltender Kristen Campbell. Campbell posted shutouts in five of her seven playoff games, including three straight to end the year. She stopped 27 shots on Sunday and was named the Frozen Four’s “Most Outstanding Player,” but Campbell was quick to defer the credit to her teammates. For Minnesota, running into Campbell ended the season of a team known for its dynamic scoring (4.1 goals per game) on a sour note. Head coach Brad Frost said his team was close, but just couldn’t finish. Wisconsin’s defensive effort played a big part in stifling Minnesota’s offense. The Badgers blocked a season-high 20 shots, and part of that was due to coach Johnson’s pregame mantra to his players. Rolfes is one of six seniors who get to go out as champions. None were more vital to this program than Pankowski, though. The 2018 Olympian and 2019 Patty Kazmaier Award finalist ends her career with 96 goals and 206 points. She also gets to do something that few do – exit as a captain of a championship team. “I’m still waiting for it to click and set in that we get to take this [trophy] home with us,” Pankowski said. “I can’t wait to see the fans in Madison and bring that home. I think that’s going to be really special.